Although their campaign has concluded, if you would still like to make a donation to support Panther Habitat for Humanity (Pittsburgh Campus), you may always do so here. 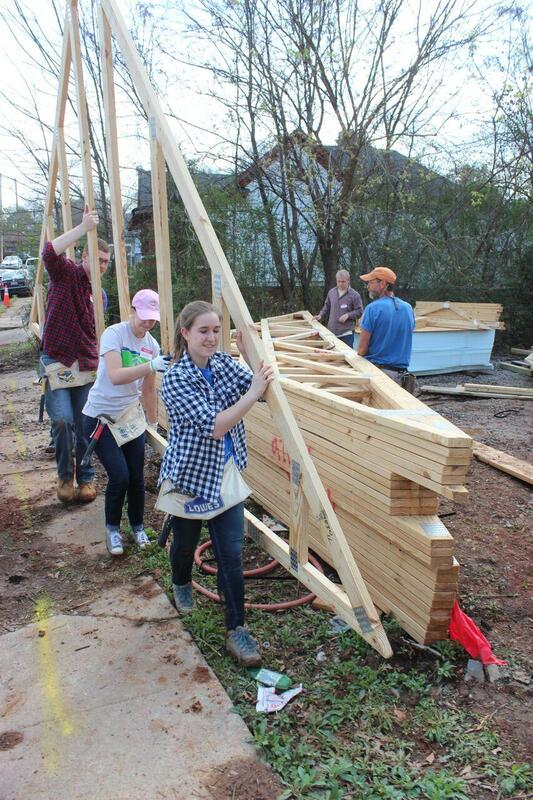 Help Panther Habitat for Humanity (Pittsburgh Campus) travel to Winston-Salem, North Carolina, to build houses for families in need over Spring Break. Every March, a caravan of minivans departs from the cold, grey hills of Pittsburgh and travels south to build houses with Habitat for Humanity over spring break. 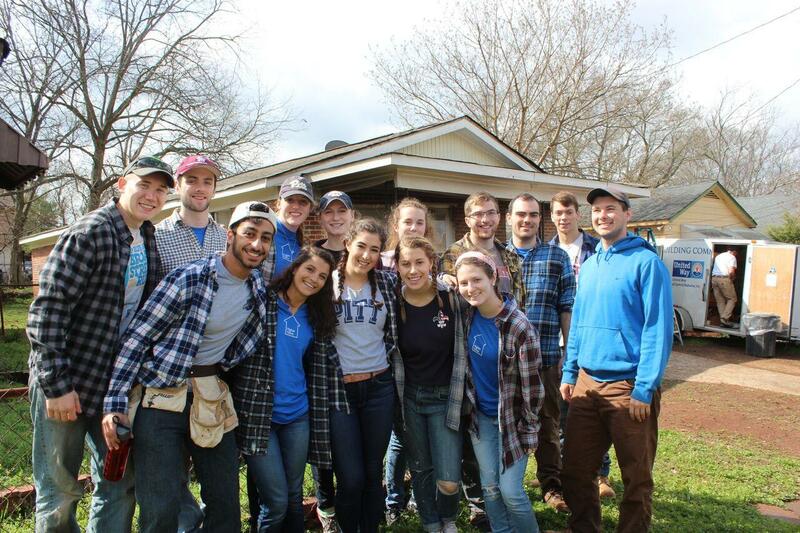 This week of service is part of Habitat’s Collegiate Challenge program, which challenges college students to work directly with Habitat affiliates to further our vision of a world in which everyone has a simple, decent place to live. Part of the group from Collegiate Challenge 2017 in Birmingham, AL. The roof behind these students was completely replaced by Pitt Habitaters over two workdays during our time in Alabama. Our Collegiate Challenge trips typically consist of 4 or 5 (depending on the trip) 6-hour days on various build sites in the area, where we frame and raise walls, install windows and doors, apply external insulation, raise the roof tresses and shingle the roof, among dozens of other small and large jobs – whatever is necessary to add to the work on the house. It’s a great chance for all of us to learn new skills, whether it’s simply hammering a nail for the first time or installing all windows and doors in a house. We frequently work alongside the future homeowners, who are required to put at least 300 hours of “sweat equity” into their new homes, and this is a wonderful opportunity for us to connect with them. Hearing their stories is very inspiring, and it always energizes our members to continue supporting the cause of affordable housing long after we’ve returned to campus. The interaction with these homeowners is the force that drives most participants to come back on the trip for their 2nd, 3rd, or even 4th Collegiate Challenge during their college career. Every little bit helps, and we are very thankful for your generous support. We look forward to updating you with stories and pictures from our week of service! Nails are vital for the structural integrity of the house. They attach pieces of lumber to form walls and hold the trusses together to make the roof. Every nail is important and without nails the house would fall apart. Tools such as hammers, tape measures, pencils, pry bars, chalk lines, and knives are essential for building a Habitat Home. Tool belts help to keep all of these tools together with each of the builders so they can make progress on the construction without having to stop and locate a tool. The circular saw is an important tool on the build site. Particle board and lumber needs to be cut to the correct size so all the components of the house fit together correctly without any gaps or overhangs. The safety of the builders is one of the most important factors on the build site. Safety equipment such as goggles, gloves, and hard hats are imperative in keeping the volunteers safe. Habitat relies heavily on volunteers on not only building the actual house, but also for food and drink donations, and supply donation. This donation pays for the cost of a volunteer through a Collegiate Challenge Trip. Lumber is the skeleton that holds the house together. Without a sturdy frame, the walls and roof would collapse upon their own weight. Lumber is essential for maintaining structural integrity of the house. A house needs doors and windows to be livable. The home owner needs to be able to enter and leave the building and enjoy sunlight while inside. These amenities are essential for every house we build. A roof is important to keep out the rain and snow and provide shade from the sun. Every house needs a roof made of trusses, particle board, tar paper, and of course shingles.